We have moths. Or, more specifically, we had moths. Over the winter holidays, I found holes in my favorite shirts, little nibbles taken from my merino wools and cashmere. I mended what I could, but my best efforts couldn’t save my wardrobe. And so I went on a cleaning rampage. At the new year I got rid of most of my clothes, saving only the quality stuff — the few articles of clothing I wear with any regularity. After taking three garbage bags of clothing to Goodwill, I came home and washed the walls of my closet, the floors, the hangers, the shelves. I did washerful after washerful of laundry, drying on high heat what I could and then line drying, ironing and freezing everything else in order to kill any larvae that might still exist. 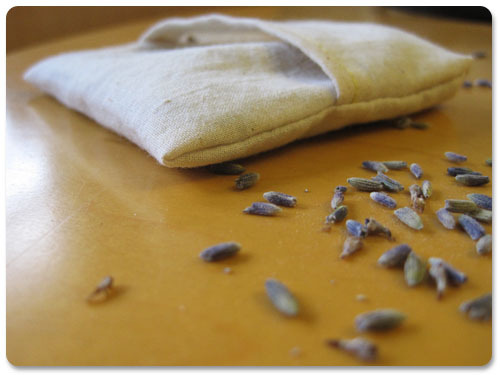 I filled our drawers and closets with cedar and lavender sachets. It was enormously satisfying paring down my closet to look like a selection at a little boutique. And it was even more refreshing to be greeted by the scent of lavender each time I opened a closet door or dresser drawer. This little adventure led me to search for lavender sachets to use in the dryer. You can find them at Trader Joe’s, but they are disposable. You can buy reusable ones at pretty much any retailer, but what really is the fun in that? Plus, I’ve found that the drawstring sachets they tend to sell open in the dryer after a few uses and so now I make my own. 1. 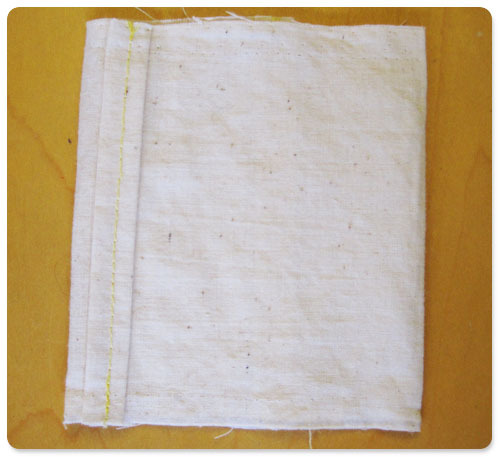 Decide how many sachets you want to make and cut the appropriate amount of muslin or other light fabric. Make sure to not use a heavily dyed fabric as it will be in close contact with your clothing. 2. Orient your fabric horizontally in front of you and create a 1/4 inch double folded hem on the left and right ends of the rectangle. Sew both hems in place. 4. 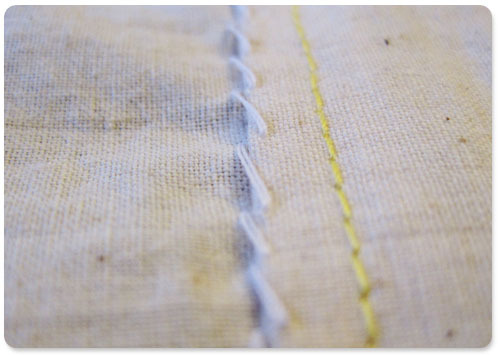 Now you want to leave the hemmed side of the sachet open and stitch the raw edges closed using whatever seam allowance you feel comfortable with. I used 1/4 inch allowance. 5. Turn the sewn pouch inside out and sprinkle the lavender inside. Fill to desired capacity. At this point, the sachet will look like the first image in this post. 6. In order to keep all the lavender inside when the sachet is spinning in the dryer, quickly whip stitch the sachet closed. These stitches will be easy to remove when you need to refill the sachet, but should keep all the lavender inside. 7. Each sachet you make can used about 10 times before needing the lavender to be replenished. It’s a really quick project that suits my senses a lot better than dryer sheets. With the reusable sachets all you’ll need to purchase again and again is lavender, which you can either grow on your own or purchase. Three summers ago I planted a lavender plant which never flowered. After pampering it and coaxing it to bloom, it never quite flourished. And then Annabelle, the dear dog we enjoyed having a slumber party with one winter weekend, decided that it looked like a chew toy and its dead, dry branches crumbled in her curious little mouth. But I’m going to try again. There’s so much to love about lavender.